Your Happiness Factor: Friday Fish Recipe - Blazing Jamaican Peppered Shrimp. 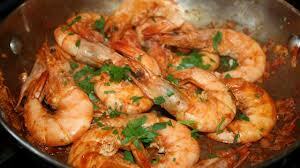 Friday Fish Recipe - Blazing Jamaican Peppered Shrimp. How to make Jamaican style pepper shrimp as you'd find being sold by the roadside in Middle Quarters in Jamaica. This spicy shrimp recipe is true to it's Jamaican heritage and has that classic Caribbean flavor and heat. Jamaican peppered shrimp is a lovely side dish for your next party or BBQ. It is a very hot dish.